mValues = are character values representing which switches are turned on. On the image below, I set the initial mValues to 1,3,5. mValues change on-the-ply, or when you turn on and off available switches. Showing new Theme 17 I created just now too. Well, I've been meaning to do this for a long time but can't find much time to work on it. But yesterday, I decided to finally do this. It is a Control class with a commandbutton that has a dropdown form with several switches based on your desire. You can think of the dropdown portion like an OptionGroup on a dropdown form, except that it does not use radiobuttons but my switches. It is more like my OptionSwitchX class but this one hides the selection until you click the button. So if you want to change the value, click on it, click anew on the popup selections (change will reflect on-the-ply), and click outside. 1. In OptionSwitchX, I manually created 12 switches as max. Anyway, for more than that need, I counter they can use a grid, listbox or combobox for the needed selections. 12 switches, IMHO, is already enough. 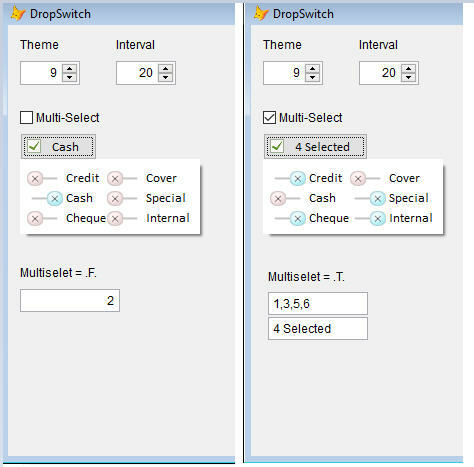 DropSwitch does not have that limitation though as switches are created on-the-ply by the class based on your Caption, e.g., Credit,Cash,Cheque,Cover,Special,Internal. So it will create 100 switches if you put 100 words separated by comma on Caption property. 3. OptionSwitchX is a container class. I made OptionSwitchX as container because I need to be able to reach inside it during design time to re-position the switches to where I want those to be. Just like if I want those to be shown in landscape format. DropSwitch, as mentioned, is a Control class. It takes care of the arrangement of the switches as controlled by Columns property. So if you want to make a single columned switches based on the caption above, you can say put 5 on Columns property. 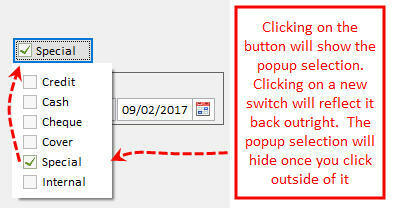 Then the class will position all switches that it will create on column 5 of the popup form (as shown above). If you put on Column a value of 5,85,165 then again it will adjust itself. 4. OptionSwitchX eats more form space in comparison with this one as what will be used by this one is just a space for a single commandbutton. You can set which of the switches based on the Caption property will be the starting value via Value property. So in the above images, starting Value is 2. _PopWidth = controls the width of the popup selections. This is a young class so I may add more features in the future. Also I may add another version of this or just simply morph this to allow Multi-Selection of switches. Cheers! P.S. This is part of ssUltimate Library.